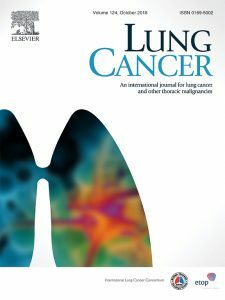 In Bangladesh, we performed a Proof of Principle Study (15 patients and 15 healthy controls) and a Validation Study (194 participants of which 148 patients) to assess the diagnostic value of an implementation of a generic electronic nose (Aerekaprobe) using exhaled air to detect active tuberculosis. Tuberculosis (Edinb). 2013 Mar;93(2):232-8. doi: 10.1016/j.tube.2012.10.002. Epub 2012 Nov 3. 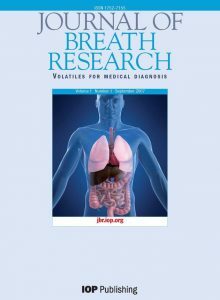 Diagnosis of active tuberculosis by e-nose analysis of exhaled air. Bruins M, Rahim Z, Bos A, van de Sande WW, Endtz HP, van Belkum A. In the validation study we found a sensitivity of 93.5% and a specificity of 85.3% discriminating healthy controls from TB patients, and a sensitivity of 76.5% and specificity of 87.2% when identifying TB patient within the entire test population (best-case numbers). Source: paper in ‘Tuberculosis’, mentioned above. 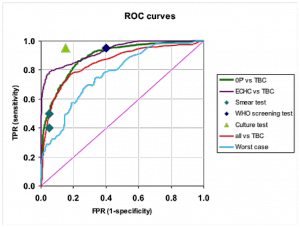 Receiver operating characteristic (ROC) curves show a clear differentiation between TB and non-TB cases. Different types of control groups were included to compensate for e.g. socio-economical differences and general health issues. The fast time-to-result of the battery operated Aerekaprobe could enable proactive searches for new TB cases, without the need for highly-skilled operators. 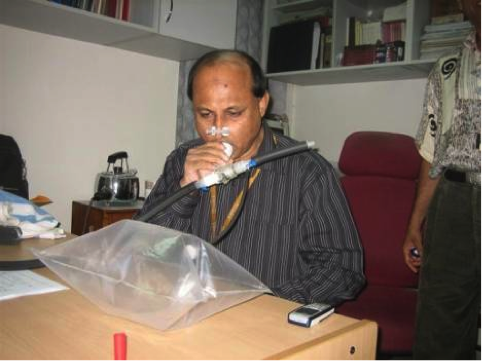 In this Bangladesh study, however, patients had to exhale into bags, which were analyzed afterwards. On the one hand, this is quite a time consuming procedure, but at the same time possibly causes introducing systematic errors because of interaction between the exhaled breath and the bags themselves. 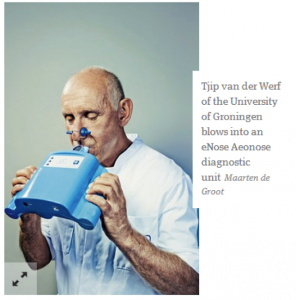 For these reasons, we have developed a dedicated eNose for exhaled-breath analysis, the Aeonose. In case of the Aeonose, bags aren’t needed anymore, and the analysis is being performed within minutes after the patient has breathed into the apparatus. Indonesia (Yogyakarta). This study is being conducted by Ms. Morita Saktiawati (PhD-student at University Medical Center Groningen, the Netherlands. Supervisor: Prof. Tjip van der Werf). With respect to distinguishing TB from non-TB patients, preliminary results (some 65 individuals have been included up till now) show sensitivity / specificity values of approx. 80% with room for improvement. A longitudinal study is in progress as well. Kenia. TB in children is being investigated by Dr Rinn Song (Harvard University) using the Aeonose. In progress. South Africa. Phase 3 study on pulmonary TB, headed by Prof Keertan Dheda (University of Cape Town) to commence soon including some 1000 individuals. Paraguay. In June 2014, this study will start focusing on extra-pulmonary TB. Headed by Dr Cecile Magis and Dr Jan-Bart Yntema from Radboud University Medical Center, Nijmegen, The Netherlands.